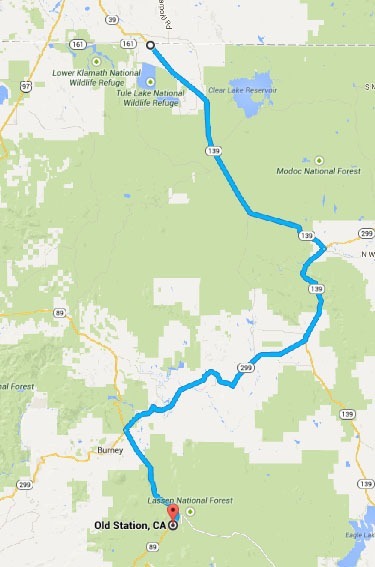 Because I decided to divide this road up into States we're going to end this section right at the Oregon border just south of Klamath Falls and take up again with our first section in Oregon. this is some of the most laid back riding of the entire trip, with long straight always through thin stands of pine trees. it's a nice change of pace and beautiful country. The great bulk of Mt. Shasta first looms in front, then off to our left as the ride progresses. Gas up in Old Station and get some snacks and water at the store as the only stop with services before Klamath Falls is at the small hamlet of Adin. No campgrounds or lodging are on the route, though there is a campground at Lava Beds National Monument, just off the route. If you enjoy geology, Lava Beds makes a good side trip.